The Vayalur Murugan Temple located in the district of Trichirapalli is a Hindu temple devoted to the worship of Lord Karthikeya and is one among the ancient temples in India built by a Chola king dating back to 1200 years. Vayalur is the place where Lord Muruga blessed the sage Arunagiri with the gift of singing and composing songs and hymns in praise of Him. In this temple Lord Muruga is seen to appear in a manner of teaching that everyone should be aware that Mother and Father come before God. The Lord Karthikeya offers his prayers to lord shiva and Goddess Parvati, his parents, to illustrate this lesson. Long ago when a Chola King came to this place in search of water after a day of hunting he found a sugar cane with three branches which he thought could quench his thirst and decides to squeeze the cane. While doing so he noticed blood oozing instead of the sweet juice. On digging the ground he found a Shiva Linga. The king then considered the place as a holy spot and built a temple there. 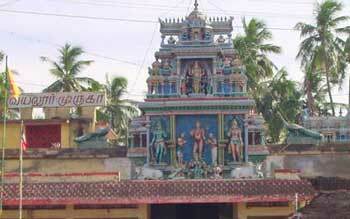 The temple functions between 6.00 am to 1.00 pm and between 3.30 pm to 9.00 pm. The temple rituals include six pujas every day performed by the temple priests. The 11 day Vaikasi Visakam during the Tamil month, Vaikasi, Thai Poosam during the month Thai, Panguni Uthiram, Adi Kirthigai and Vaikasi Visakam which celebrates the birth star of Murugan in the Month of May to June. Other festivals that includes the monthly Pradosham, Amavasai and Pournami are some days where special pujas are performed in the temple.